Several weeks ago I found myself with an abundance of potatoes and realized there was no way RancherMan & I could eat them all before they went bad. I went into high-gear preservation mode & dehydrated many of them, but some of them went into the freezer. When I freeze potatoes I cook and mash them but add nothing else – no salt, pepper, milk or butter – just cooked mashed potatoes. I section them in sandwich bags into serving sizes & freeze them into individual bricks. The potatoes are often enjoyed for supper that night by simply heating them and adding salt & pepper, a small pat of butter and maybe a light splash of milk. I can tell no difference in these potatoes and the potatoes I’ve cooked fresh & mashed. 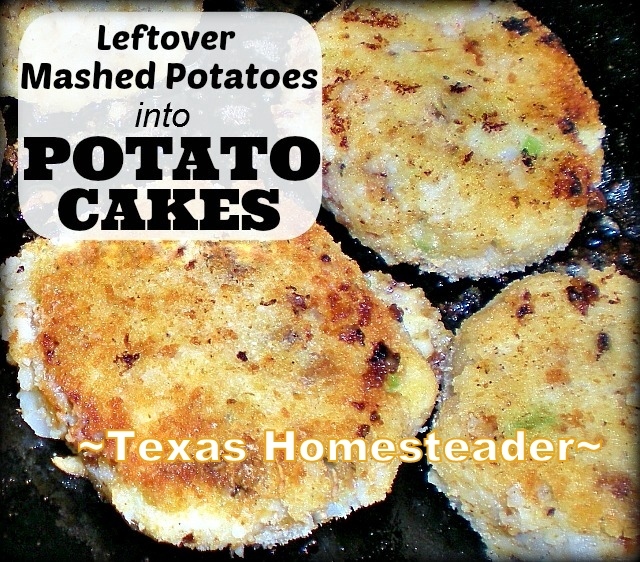 But I’ve found RancherMan’s absolute FAVORITE way to eat leftover mashed potatoes – POTATO CAKES! Now we don’t often eat fried foods but I view it as I view anything else in our healthy diet – moderation in all things. So occasionally I’ll make potato cakes for RancherMan – they’re super easy to whip up. I pull out those leftover mashed potatoes and if they were previously frozen I’ll drain the water from them, and into the bowl the potatoes go. I’ll add an egg and some minced veggies like onion or garlic or maybe bell pepper – it all depends on what I have on hand needing to be used. Then I’ll add salt & pepper and enough fine bread crumbs to make the mixture thick enough for me to roll into small balls. I like to have another saucer of breadcrumbs set aside to coat the potato cakes. Here’s how I cook them: I take out my cast-iron skillet and add enough Bacon Grease to cover the bottom. Then I turn the stove to medium heat. When the oil is hot I take a potato ball and roll it in my reserved bread crumbs pressing it into a thick patty & being sure to coat all sides. Then I take that patty and drop it into the hot grease. I continue to make up the remaining potato cakes in the same manner. After a short time I gently flip the potato cakes to brown the other side. Then I serve ’em up as a side dish with our supper. They’re crispy on the outside and soft and savory on the inside. We LOVE them. Since potato cakes are made from leftover mashed potatoes it’s a very inexpensive way to remake a leftover item into something new & delicious. Planned Leftovers, y’all! As I mentioned earlier it’s so easy to change ’em up each time to either use what you already have or to flavor them to go with your meal. Sometimes I add shredded cheese or chopped chives. And sometimes I season them with Italian or Mexican spices to go with our main-dish theme. It’s very flexible and a very forgiving recipe. Keep in mind that the potatoes need to be cold to make them easier to handle. And the potato cakes are slightly fragile both going into the skillet as well as serving them up freshly fried. So take care when handling them. But it’s such an easy way to make my RancherMan happy at suppertime. Into cold leftover mashed potatoes mix one egg and some minced onion, bell pepper and/or garlic into potatoes. Season with salt & pepper and then mix in enough breadcrumbs to make the mixture thick enough to roll into approximately 1" balls. Set aside about another 1/4 cup breadcrumbs if desired for coating. Pour enough oil to cover the bottom of your skillet and heat at medium until hot. Take each ball of potato and roll in reserved breadcrumbs to coat, mashing ball into a thick patty and place patty into hot oil. Cook each side until brown and serve. 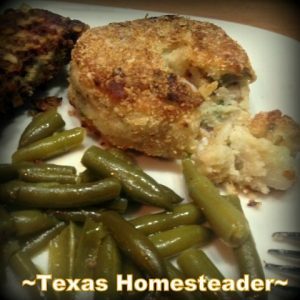 This entry was posted in Blog Posts and tagged Cooking, Frugality, Recipes on March 7, 2014 by Texas Homesteader. Wow! This brings back memories of my childhood!! Love potato cakes!! Thanks for sharing on My 2 Favorite Things on Thursday! Hope to see you again tomorrow! Pinned!! I first experienced these after I married my husband. My mother-in-law made what she called potato pancakes and they were oh so good. This recipe looks yummy too! I do LOVE anything potato and these look fantastic! Thanks for sharing on Farmgirl Friday Blog Hop! YUMMO! As many of us have experienced especially around the holidays, to many mashed or baked potatoes. I love being able to re-use leftovers in a way that will make them not taste like leftovers. I am excited to try your recipe. Thanks for sharing on Merry Monday. These sound SOOO yummy! Thanks for sharing your recipe on this week’s Monday Funday Party! Yummy! I have not had a potato pancake since I was a kid!! Love!! Thanks for linking up with My 2 Favorite Things on Thursday – Party!! I love having you!! Pinned! we love taters here any way you cook em 🙂 I can’t wait to try your potato cakes – they sound delish!! thanks for sharing with us at Snickerdoodle Sunday! These look so great! I have tried to make potato cakes in the past but without egg and they never really turn out, they just crumble when I try to flip them. Do you have any suggestions for what I could use instead of the egg? My husband is a big fan of potato cakes too. His favorite is mashed potatoes with a little cheddar, cilantro and jalapenos. Put an over easy egg on top and he is in love! These look delicious! I am thinking with some breakfast eggs in the morning too. A nice ranch-style meal 🙂 Thank you for sharing this week on the Art of Home-Making Mondays! I really enjoy my visits here and always get ideas! This looks amazing found your post at Fabulous Friday! That is the perfect thing to do with leftover mashed potatoes. I bet they don’t last long! I haven’t had potato pancakes in ages. These look delicious! I’ll need to remember this idea for leftovers later on. These make me think of mom 🙂 She used to make these when I was a kid! My mom used to make something similar to this when I was growing up and I always loved them! Thank you so much for linking up at Tasty Tuesday! Your recipe has been pinned to the Tasty Tuesday Pinterest board! Please join us again this week! It’s not often that our family of six has leftovers, but I love this idea of potato cakes. Kind of reminds me of Japanese croquettes. Will give this a try for some of our meatless meals. Thanks for sharing on Merry Monday Linky Party. Pinned. What a great way to use leftover mashed potatoes! These sound great! I use our left over mashed potatoes to make potato biscuits. Yummy. Never tried to freeze the leftover potato and then re-use later, but that sounds like worth trying too. This looks so good! Thanks for sharing at TTF! Growing up these were made with mashed or shredded potatoes & shredded garden whatever– zucchini. carrots, onion, green tomatoes. We called them Alot kes (meaning a lot of latkes). We were the only ones I knew of that had them with applesauce. People look at me strange when I say we ate them with applesauce. I think we’ll have them for dinner tonight (thanks for the idea). Just the cakes & applesauce. Another idea for leftover mashed potatoes is to mix them with severely shredded, cooked boneless chicken & 1 egg then roll them into croquettes. Next roll them into bread crumbs and place on cookie sheet; brush with olive oil and bake 15 min at 450F. I make biscuits & gravy to go along, BTW left over croquette biscuit sandwiches with a little mayo make an awesome sack lunch. These sound so comforting and good. My mom knows how to pinch a penny, and she use to make something similar for us. I would love for you to share at the Bacon Time linky, if you have not already. Have a great end of the week. I giggled and nodded knowingly about “not eating alot of fried foods” here in East Texas and they fry anything and everything here. I remember a conversaton with a friend about fried biscuits… I couldn’t believe they would deep fry a biscuit! Im with you though and over time my husband has seen the light that not everything has to have an oil bath to be good! Potato pancakes are a favorite here… we have never rolled them in bread crumbs and I am going to have to try that. Girl after my own heart. You have such great ideas for stretching the pennies… right down to the potato water for the endless soup pot. Never thought about freezing leftover mashed potatoes. Potato pancakes make my hubby happy too. Thanks for the recipe!